The 2016 College Football season is right around the corner and that means prediction time. Below are five predictions for the Sun Belt Conference for the 2016 season. Some predictions will be right, some predictions will be wrong, and some will be spectacularly awful by the end of the season. There are no changes to the teams in 2016 as all eleven teams will be the same from 2015. Those 11 teams are Appalachian State, Arkansas State, Georgia Southern, Georgia State, Idaho, Louisiana Lafayette, Louisiana Monroe, New Mexico State, South Alabama, Texas State, and Troy. 1. Georgia Southern’s Matt Breida will lead the Sun Belt in rushing – This is going out on a bit of a limb as there are some very good running backs in the Sun Belt. Breida was the #2 rusher in the SBC last year (#10 in the FBS) with 1,608 yards. He still has to contend with the Larry Rose III of New Mexico State who was top rusher in the SBC as well as #8 in the FBS with 1,651 yards. Outside of Breida and Rose, Marcus Cox of Appalachian State (1,423 yards) and Elijah McGuire of Louisiana Lafayette (1,058 yards) are capable of leading the conference in rushing. Breida and Georgia Southern are switching coaches, but the offensive scheme is staying the same with the triple option. This will be a fun race to watch as to who will end up with the most rushing yards in the Sun Belt for 2016. 2. Arkansas State or Appalachian State will win the Conference – Alright, this is not going out on a limb at all. When looking at this conference, it is hard to envision that one of these teams will not capture the crown. Arkansas State loses the duo of quarterback Fredi Knighten and running back Michael Gordon but Pittsburgh graduate transfer Chad Voytik comes in to give the Red Wolves a very good replacement. Overall, Arkansas State has 13 starters back with six on offense and seven on defense. For Appalachian State, they went 11-2 last year and return 15 total starters with 6 on offense and 9 on defense. They have Cox at running back returning (see above) as well as quarterback Tyler Lamb, who threw for 2,387 yards with 31 touchdowns against 9 interceptions. The defense gave up only 19.1 points and 314 yards per contest in 2015 and may approach those numbers again this year. There is also the convenient scheduling quirk that Arkansas State and Appalachian State do not face each other in 2016. The other logical Sun Belt contender is Georgia Southern, but they have to face both Arkansas State (away) and App State (home). 3. Texas State will not win more than 3 games in 2016 – The Bobcats look to have a rough 2016 season ahead of them. They have a new head coach in Everett Withers after five seasons of Dennis Franchione (2011 through 2015). Franchione led the Bobcats to a 26-34 record as they went from the FCS in 2011 to full time FBS members. It was a respectable job done by him, but both sides of the ball regressed in 2015 and he resigned after the season. For 2016, Texas State has 10 total starters returning with four on offense (26.9 points and 414 yards per game) and six on defense (39.2 points and 522 yards per game allowed). Their non-conference schedule has what appears to be just one winnable game against FCS Incarnate Word while also facing Ohio (away), Arkansas (away), and Houston. They do face fellow SBC dwellers Louisiana Monroe, New Mexico State, and Georgia State, but all three of those games are on the road. 4. New Mexico State’s bowl drought will extend to 56 years – This seems like a no-brainer, but at least one person thinks otherwise. The Aggies do have some talent like the aforementioned Larry Rose and also add in the very talented Tyler Matthews (was previously at TCU and Southern Miss). The defense will be coached by former Boston College Head Coach Frank Spaziani, but he has a lot of work to do. The 2015 defense gave up 45 points and 522 yards per game with 8 starters back. Now seven return in 2016 and it is not always a good thing to have that many back from a defense that poor. Yes, Spaziani will make strides, but to get a group like this to be competitive enough off the 2015 season is asking a lot. New Mexico State also has a tough schedule in 2016 to reach a bowl game. They face UTEP (away), New Mexico, Kentucky (away), and Texas A&M (away). In conference, the Aggies will face Louisiana Lafayette, Georgia Southern, Arkansas State (away) and Appalachian State. Their winnable games are against Idaho, Texas State, and perhaps South Alabama. It is difficult to foresee both sides of the ball improving enough to get to 6 wins in 2016, especially on defense. 5. Idaho will make a bowl game – This is more of a sentimental/hope it happens prediction. Idaho is slated to leave the FBS after the 2017 season and join the Big Sky Conference of the FCS in 2018. That leaves Idaho two last chances to make their third bowl game in school history after playing in the Humanitarian Bowl twice in 1998 and 2009 (won both games). There are legitimate reasons to think Idaho can make a bowl game starting with the offense. Under Paul Petrino, Idaho has improved their points and yardage output per game each year with 2015 at 30.3 points and 428 yards per game. Quarterback Matt Linehan (2,972 yards on 63.1% completions with 16 touchdowns and 11 interceptions) will have three of his top four receivers back and four of the offensive linemen return as well. The offense will continue to move along. The real issue is on defense for Idaho as their best season performance under Petrino was in 2014 when they surrendered 37.3 points and 463 yards per game. Those numbers only give opposing offenses more confidence. There are six starters back from 2015, but that is not always a good thing when they perform as poorly as they did last year. They are under the second year of Defensive Coordinator Mike Breske, which may explain some of the drop from 2014. Idaho does have a solid chance to reach the six win plateau. The open with Montana State, Washington (away), Washington State (away), and UNLV (away). Their conference foes consist of winnable games versus Louisiana Monroe (away), New Mexico State, Texas State, (away) South Alabama, and Georgia State. They also face Troy, App State (away), and Louisiana Lafayette (away) in games that appear to be likely losses, but an upset could happen (that is why they play the games, right?). If Idaho can beat Montana State and UNLV out of conference, they should have a good chance at reaching 6-6 with their conference schedule. With the Sun Belt Predictions above, there are now predictions for two conferences in the books. Below are the predictions completed and what is next. 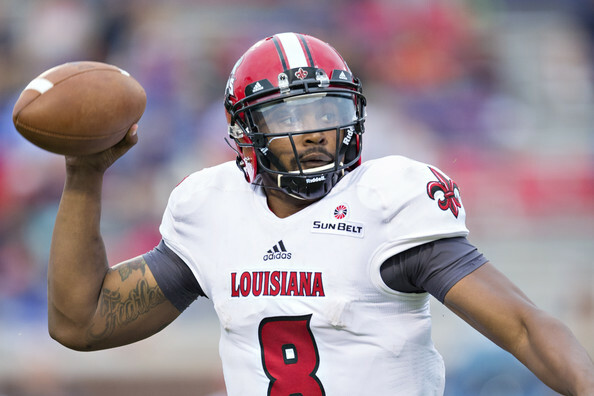 Part eight of Sports Enthusiasts 2015 College Football Preview will look at the 11 teams in the Sun Belt Conference. In addition, the FBS Independents Preview can also be seen here in this double release. Below is a schedule of the conferences that have already been previewed and which ones are still ahead. Below is a look at each of the Sun Belt teams and their outlook for 2015. Arkansas State has finally found a bit of stability in their head coach after seeing four different coaches in four seasons from 2011 through 2014. Blake Anderson came in for the 2014 season and led Arkansas State to a 7-6 record and 5-3 in the Sun Belt. 2015 is looking pretty good for Arkansas State as well. 2014 saw only three starters back for the Red Wolves on offense, but that was not an issue as they put up 36.7 points and 476 yards of offense. Quarterback Fredi Knighten will lead another high powered attack after throwing for 3,277 yards with 24 touchdowns and 7 interceptions. He also ran for 779 yards and 11 touchdowns and he will have his main workhorse running back returning as well. Michael Gordon ran for 1,100 yards and 13 touchdowns making this backfield incredibly dangerous in the Sun Belt. ASU had three receivers with at least 35 catches and 600+ yards in 2014 and all three are back (Tres Houston, Dijon Paschal, JD McKissic). It is scary to think that ASU could put up even higher numbers in 2015 with nine starters back, but it is a strong possibility with one of the best, if not already the top, offense in the Sun Belt. The defense returns six starters after surrendering 30.5 points and 421 yards per game last year. Three defensive linemen are back after giving up 205 yards rushing per game including Chris Stone. Stone had 48 tackles, 7.5 sacks, and 2.5 tackles for loss in 2014 and will need to have a strong year again. ASU lost their top linebacker from a year ago, but do return the other two. The secondary has only one starter back in Money Hunter and will possibly struggle back there. The Red Wolves may struggle at times, but should have a similar season defensively that they produced last year. Arkansas State opens with a road game at USC before back-to-back home games against Missouri and Missouri State. They travel to face Toledo before entering conference play. They have some tough games in the Sun Belt with Appalachian State and UL-Monroe on the road as well as UL-Lafayette and Texas State at home. They are the team to beat in the Sun Belt with this offense. Texas State has been part of the FBS since 2012 and head coach Dennis Franchione has been with them since 2011. The Bobcats have not been bad by any stretch of the imagination as they have three seasons of 6-6 or better. 2015 is a great chance for them to make their first bowl game in school history. The offense will return eight starters from a unit that put up 33.8 points and 464 yards in 2014. Tyler Jones threw for 2,670 yards with 22 touchdowns and 7 interceptions while rushing for another 539 yards and 6 touchdowns. Running back Robert Lowe ran for 1,091 yards and 12 touchdowns while the return of Chris Nutall could give the Bobcats an excellent 1-2 punch. Bradley Miller was the top receiver last year with 44 catches for 431 yards, but the second, third, and fourth leading receivers from 2014 return and could have a better year of production. The offense will continue to do well for Texas State. The defense was respectable last season with only four returning starters back. They gave up 27.7 points and 446 yards per game and now return six starters for 2015. Three starters are back on the line while linebacker will have to replace the monster in David Mayo. Mayo recorded 154 tackles in 2014 and it will fall to Trey McGowan to lead the unit (80 tackles in 2014 as the team’s second leading tackler). Two starters are back in the secondary and should see some steady improvement over 2014. The defense should be no worse than they were a year ago even with Mayo gone. Texas State has Florida State on the road to start the season while they will then play the duo of Prairie View and Southern Miss at home. They will face Houston on the road to close out the non-conference portion before facing UL-Lafayette on the road with that game sandwich between two bye weeks. Other games that will be a test include Georgia Southern (road), UL-Monroe )home), and Arkansas State (road) in the final week of the season. That final game could determine which team is the winner of the Sun Belt in 2015. Georgia Southern’s first year in the Sun Belt in 2014 was simply amazing. They went undefeated in conference play at 8-0 and finished the year at 9-3. They lost by a grand total of five points to North Carolina State and Georgia Tech on the road as well. Thanks to an NCAA rule prohibiting transitional teams from the FCS to make bowl appearances, they were not in the post-season. Could 2015 provide Georgia Southern with a second straight championship? The offense was spectacular in 2014 with 39.1 points and 488 yards of offense produced per game. The main core of the offense is back with five starters returning. Kevin Ellison threw for 1,001 yards, five touchdowns, and three interceptions while finishing second on the team in rushing at 1,096 yards and 12 touchdowns. The top running backs all return led by Matt Breida. He had 1,485 yards and 17 touchdowns while Alfred Ramsby (691 yards and 12 touchdowns) and Favian Upshaw (385 yards and 2 touchdowns) are returning as well. The number one and three receivers depart, but BJ Johnson led the Eagles in catches with 23 for 312 yards and 3 touchdowns. The passing game is not the focus of the offense, but there is only one starter back on the line. The offense will still be potent in 2015, but it may not reach the same heights it did last year. The defense performed quite admirably in 2014 by allowing 23.4 points and 388 yards per game in the Eagles’ first full FBS season. The entire defensive line returns intact after giving up 154 yards per game and 4.3 yards per carry. Linebacker is the weak spot with only Antwione Williams back after recording 65 tackles, 3 sacks, and 5 tackles for loss and the loss of Edwin Jackson will be tough (100 tackles to lead team). The secondary returns three starters from a group that allowed 58.5% completions. The defense will be solid again in their second year of FBS play. The Eagles will open the season on the road at West Virginia before back-to-back home games versus Western Michigan and The Citadel. They open conference play after that with back-to-back road games against Idaho and UL-Monroe. Their final non-conference game is in late November at Georgia. They will have to face the likes of Appalachian State (road) and Texas State (home), but avoid Arkansas State and UL-Lafayette. Georgia Southern should be in their first bowl game (they are eligible this year) and should finish high in the Sun Belt. 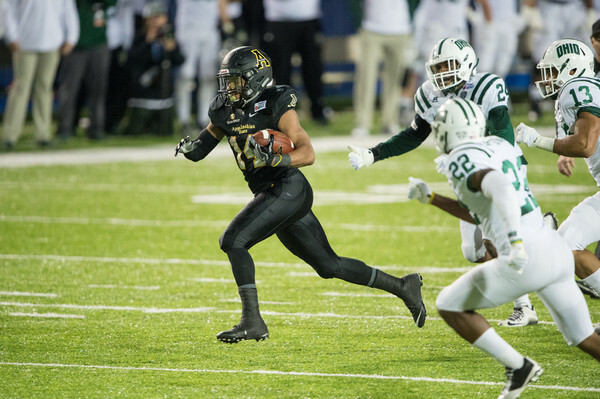 Like Georgia Southern, Appalachian State was in their first full FBS season in 2014. They had an awful start going 1-5 before winning their final six games to finish 7-5. Also like Georgia Southern, they were not eligible for a bowl game. The offense returns a whopping 10 starters after averaging 35.7 points and 462 yards per game last year. Taylor Lamb threw for 2,381 yards with 17 touchdowns and 9 interceptions while also rushing for 483 yards and 4 touchdowns. The top two rushers, Marcus Cox (1,415 yards and 19 touchdowns) and Terrence Upshaw (573 yards and 4 touchdowns) are back as well. The top five receivers also return though the top two receivers, Malachi Jones and Simms McElfresh, will need to have better production. Jones caught 36 passes for 585 yards and 3 touchdowns while McElfresh had 42 catches for 484 yards and 5 touchdowns. Four starters return on the offensive line as well, which only helps. This offense looks scary and could be even scarier if the passing game improves. The defense is a mirror image of the offense in that ten starters return. The defense gave up 27.3 points and 348 yards per game with the top six tacklers back. The entire line remains intact after allowing 152 yards per game and 4.3 yards per carry. Ronald Blair will be at one of the end spots after recording 43 tackles, 6 sacks, and 7 tackles for loss. All four linebackers are returning as well in this 3-4 scheme. John Law led the team in tackles with 91, but also recorded 2 sacks, 4 tackles for loss, and an interception. The secondary has three of the four starters back after giving up 195 yards and allowing 59% completions. The defense should be just as good this year. App State will face FCS Howard opening week before going on the road to face Clemson. They will have a bye week before facing Old Dominion on the road and Wyoming at home to end their non-conference schedule. App State has several tough games in conference that may prevent them from winning the title. They have UL-Monroe (road) and Georgia Southern (home) in a span of five days from October 17 to October 22. They also have to face Arkansas State and UL-Lafayette, but get both of those at home. It is tough to pick App State fourth with the amount of experience returning, but they should make their first bowl game in school history at the very least. Louisiana-Monroe has been to only one bowl game in school history and that was a 45-14 loss in 2012 to Ohio in the Independence Bowl. The Warhawks have gone downhill since then with a 6-6 record in 2013 and 4-8 record in 2014. This season must provide a better result if Todd Berry hopes to stick around for 2016. The offense returns six starters from a unit that produced only 20.1 points and 349 yards per game. The rushing game was abysmal with only 70 yards per game. Both the top passer and rusher are gone, but the running back production is easy to replace given the awful stats put up. Brayle Brown is expected to be the starting quarterback , but he went 14 of 24 for 172 yards with a touchdown and interception in backup duty. Brown will have two of the top receivers back in Rashon Caeser (77 catches for 872 yards and 3 touchdowns) as well as Ajalen Holley (57 catches for 863 yards and 7 touchdowns) to help him out. Three starters are back on the line and assuming the running game has better production (how can they not?) the offense will be better even with a new quarterback. The defense will have eight starters back after a solid season in 2014 when they gave up 26.3 points and 373 yards per game. Two of the three defensive linemen return and the guy to watch out for is Gerrand Johnson. As a nose tackle, he led ULM with 93 tackles while also recording 6 sacks and 6.5 tackles for loss. Three of the four linebackers return in Mitch Lane, Hunter Kissinger, and Michael Johnson, which is a good sign because they were the second, third, and fourth leading tacklers respectively last year. The secondary also has three starters back with Trey Caldwell at one of the cornerback spots. He was was solid with 42 tackles, 1 tackle for loss, 8 pass breakups, and an interception. The ULM defense should be one of the best in the Sun Belt. Louisiana-Monroe has five non-conference games spread over the course of the season thanks to a trip to Hawaii. They open with a road game at Georgia before a home date against Nicholls State. A bye week leads into a game at Alabama before conference play commences. ULM will travel to face Tulsa (Oct. 10) and Hawaii (Nov. 28) later in the season. The Warhawks have quite a few tough in-conference games with Georgia Southern (home), Appalachian State (home), UL-Lafayette (road), Arkansas State (home), and Texas State (home) all on the slate. That daunting schedule may keep them from finishing higher in the Sun Belt. Since Mark Hudspeth took over Louisiana-Lafayette in 2011 there have been two constants each year: a 9-4 record for the year and a win in the New Orleans Bowl. Will 2015 be a carbon copy of the first four years under Hudspeth? The offense has six starters back, but the loss of Terrance Broadway will hurt the team. Brooks Haack threw for 179 yards and 2 touchdowns in backup duty last year and will probably not match the ability of Broadway. Elijah McGuire is back after running for 1,264 yards and 14 touchdowns and will be the main back in this offense. McGuire is also the top leading receiver returning after having 45 catches for 468 yards and 2 touchdowns. The top returning wide receiver is Al Riles who had 34 catches for 354 yards and a touchdown. Three offensive linemen also return, but the offense will struggle at times with many new personnel at the skills positions. The defense also has six starters back after allowing 26 points and 406 yards per game in 2014. Only the second and seventh leading tacklers return from the top eight.The defensive line has only Jacoby Briscoe back from last year, but he started just four games. Dominique Tovell was the second leading tackler last year with 67 stops, 2.5 sacks, and 6.5 tackles for loss and will be leading the linebackers. Two starters are back in the secondary and should improve on their 65% completions allowed. The defense will probably allow similar numbers to last year. ULL will open the season with a road game against Kentucky and then welcome Northwestern State home. After a bye, ULL will face Akron at home and then play Louisiana Tech on the road. In conference, ULL has several tough games to start conference play. They face Texas State at home and then take on Arkansas State on the road. They also have UL-Monroe (home) and Appalachian State (road). UL-Lafayette will be looking for a fifth straight bowl game and have a good shot at getting there. New Mexico State was a member of the Sun Belt from 2000 through 2004 before joining the WAC for the 2005 season. They rejoined the Sun Belt in 2014 and went 2-10 in both of Doug Martin’s first two seasons. 2015 provides Martin with his most experienced team. The offense made good strides in 2014. They put up 24.5 points and 421 yards per game with eight starters back in the fold. Eight starters are back in 2015 including the top skills players. Quarterback Tyler Rogers threw for 2,779 yards with 19 touchdowns, but had an incredibly high 23 interceptions as well. Larry Rose ran for 1,102 yards and 9 touchdowns despite missing time due to a sprained MCL. Teldrick Morgan caught 903 yards and 7 touchdowns on 75 receptions and will the be the top target once again. With four starters back on the offensive line as well, the Aggies can expect to have another improvement in the offensive numbers in 2015. The defense has not been good for Martin in his first two years. In 2013, the unit allowed 44.6 points and 550 yards per game, but did improve in 2014 to 39.1 points and 484 yards per game. 2015 will have ten starters back for the defense with the only loss on the line. The line produced only five sacks in 2014 and will need to improve on that. The linebackers return and that is good thing for the Aggies because Rodney Butler (119 tackles and 7.5 tackles for loss), Derek Ibekwe (102 tackles and 4 tackles for loss), and Dalton Herrington (85 tackles, 1 sack, and 2 tackles for loss) were the team’s top three tacklers. The secondary was not too bad last year giving up 175 yards and 62.5% completions. The defense should continue to improve overall, but could make a big step forward if the line surprises with better rush defense. The Aggies will open with a road game at Florida before starting Sun Belt play in week two against Georgia State at home. They will face rival UTEP at home in week three and complete their non-conference schedule after a bye week with road games at New Mexico and Ole Miss. In conference, they will have to face Georgia Southern (road), Texas State (road), UL-Lafayette (road), Arkansas State (home), and UL-Monroe (road). The Aggies are a young team and should be able to continue improving while winning more than two games in 2015. South Alabama has been a member of the Sun Belt since 2012 and made their first bowl game last year against Bowling Green in the Camellia Bowl. Joey Jones has been with South Alabama since they started back in 2009 while 2015 will probably be the most interesting season to date with only five total starters returning. South Alabama has only three starters back on offense, but have a few UAB transfers coming in as well. Quarterback Cody Clements is one of those UAB transfers and he will also have his offensive coordinator coming over as well. Clements threw for 2,227 yards with 14 touchdowns and 8 interceptions in 2014. The duo of Xavier Johnson (438 yards and a touchdown) and Terrance Timmons (403 yards and 4 touchdowns) are returning at running back, but may be beat out by Dami Ayoola. The top wideout is also gone, but Danny Woodson (former Alabama player) caught 30 passes for 382 yards and 4 touchdowns last season. The UAB duo of DJ Vinson and Josh Magee are looking to team up with their former quarterback. There is another UAB transfer on the offensive line, which returns only two starters. The offense averaged 22.5 points and 376 yards last year and will probably be able to at least match that in 2015. The defense has only two starters back from a unit that allowed 26.4 points and 399 yards per game. The defensive line is bereft of experienced starters with none back. The linebacker unit is the same, but does add in UAB transfer Kalen Jackson as well as Texas Tech transfer Blake Dees. The two starters back on defense reside in the secondary with Roman Buchanan and Antonio Carter. Buchanan was third on the team in tackles with 74 while also recording 3.5 tackles for loss and 7 pass breakups. The defense has little experience and will likely struggle to meet last year’s numbers. South Alabama opens their season with Gardner-Webb at home before embarking on a two game road trip against Nebraska and San Diego State. They wrap up conference play against North Carolina State. They have a tough games in Sun Belt play against Arkansas State (home), Texas State (road), UL-Lafayette (home), Georgia Southern (road), and Appalachian State (home). South Alabama appears headed for a down year with only five starters back. Troy has not been to a bowl game since 2010 when the destroyed Ohio in the New Orleans Bowl 48-21. Larry Blakeney had been head coach of Troy since 1991, but they have opted to move on and take Neal Brown in as their top man. Troy was not very good on offense last year with only 21.8 points and 363 yards per game. Seven starters return in the first year under Brown’s offense. Brandon Silvers threw for 1,836 yards, 11 touchdowns, and 3 interceptions while completing 70.5% of his passes. The top two running backs also return with Brandon Burks and Jordan Chunn. Burks ran for 584 yards and 3 touchdowns while Chunn ran for 505 yards and 6 touchdowns. The top wideout is also back in Bryan Holmes (34 catches for 474 yards and 5 touchdowns), but the production will need to improve from that unit. There are two starters back, but the offense should be able to match last year’s production at least in 2015. Six starters are back from a unit that allowed 36.2 points and 454 yards per game in 2014. The defensive line has three starters back, but gave up 246 rushing yards per game in 2014. End Jamal Stadom was third on the team in tackles with 55 while also recording 4.5 sacks and 2 tackles for loss. The three starting linebackers are gone from last year’s team, but Terris Lewis was able to start three games en route to recording 25 tackles despite playing only five games. The secondary returns two starters in JaQuadrian Lewis and Montres Kitchens while also adding in UAB transfer LaMarcus Farmer. The secondary should be solid again in 2015 after allowing 208 passing yards per game in 2014. The defense should improve in 2015 despite a new head coach. Troy does not have an easy non-conference schedule. They open with a road game at North Carolina State, come home to face FCS Charleston Southern, and then goes on the road again to Wisconsin. They also face Mississippi State in Starkville on October 10. In conference, Troy will face Appalachian State (road), UL-Monroe (home), Georgia Southern (home), and UL-Lafayette (road). They also take on South Alabama (home) and New Mexico State (road) that could determine how high they finish. Troy should see improvement in 2015, but not good enough to make a bowl game. Idaho has not had sustained success since the 1990s and have only two bowl game appearances in school history. Their last, a 43-42 win over Bowling Green, came in the 2009 Humanitarian Bowl. Paul Petrino took over a very bad team and has gone a combined 2-21 in his first two years. The offense will have six starters back from a unit that improved between 2013 and 2014. The offense put up only 18.2 points per game in 2013, but saw that number increase to 25 last year. Quarterback Matt Linehan threw for 2,540 yards with 11 touchdowns, but also threw 18 interceptions. Elijhaa Penny ran for 589 yards and 12 touchdowns while splitting the carries and is likely to earn the number one reps. The wideouts see the top three depart from 2014, but back on the team is Dezmon Epps. Epps had 980 yards and 4 touchdowns in 2013. There are three starters back on the line and the Idaho offense should continue to improve. The defense also has six starters back. Like the offense, they have also improved in Petrino’s first two seasons. They allowed 46.8 points and 529 yards per game in 2013 while dropping those numbers to 37.3 points and 463 yards per game. The two interior linemen return led by Quinton Bradley. Bradley had 52 tackles, 6 sacks, and 3.5 tackles for loss last season. Two linebackers return including 2014’s leading tackler Marc Millan. Millan had 102 tackles, 2 sacks, and 13 tackles for loss. The secondary has Jayshawn Jordan at cornerback and Russell Siavii returning. The defense will continue to improve this year, but may hold the Vandals back from doing even better. Idaho will open their season with Ohio at home before a road game at USC and then another home game against Wofford. They will also face Auburn on the road on November 21. In conference, they have a very tough schedule with games against Georgia Southern (home), Arkansas State (road), UL-Monroe (home), Appalachian State (home), and Texas State (home). Idaho should be able to easily match two wins in 2015, which is the total number of wins under Petrino entering the season. Georgia State started their football program in 2008 and played their first season in 2010. They went 9-13 in their first two season facing mainly FCS competition. Since joining the FCS’ Colonial Athletic Association in 2012 and then the Sun Belt in 2013, they have a combined record of 2-33. Trent Miles will be in his third season at the helm of Georgia State in 2015. Miles will eight starters back on offense, but that is only the second highest number of returning starters on offense under his regime (9 in 2013). Nick Arbuckle won the starting job and threw for 3,283 yards with 23 touchdowns and 17 interception. He will be back to throw the ball all over the yard, but could use help from his tandem of running backs in Marcus Coffey and Kyler Neal. Coffey only ran for 354 yards and 3 touchdowns while Neal ran for 209 yards and a score (Neal suffered an MCL injury that caused him to miss the last 8 games. Those two were also the leading rushers on the team. Arbuckle will have his top two receivers from 2014 back with Donovan Harden (60 catches for 885 yards and 7 touchdowns) and Robert Davis (50 catches for 732 yards and 2 touchdowns). The offense put up 22.7 points and 375 yards per game in 2014. If the running game improves even slightly, they should easily surpass those numbers. The defense was bad last year with only four returning starters. The unit gave up 43.3 points and 497 yards per game. Miles will have his most experienced defense in 2015 with nine starters returning. The entire defensive line is back including the entire two deep in this 3-4 defense. After giving up 303 yards rushing per game, it is safe to say GSU can only improve there. At linebacker, Joseph Peterson is back after leading the team in tackles with 93. He also added 3 sacks, 1 tackle for loss, and an interception. He will be joined by former Michigan player Kaleb Ringer. The secondary has all four starters back, but was not as bad as the numbers would indicate. They gave up only 194 passing yards per game, but did allow 68.1% completions against them. The defense should get better in 2015 compared to 2014. Georgia State does have a chance to win a few games in 2015. They open with Charlotte at home before back-to-back road games at New Mexico State and Oregon. They face Liberty at home and then also face Ball State on the road to close out their non-conference schedule. The conference portion of their slate is daunting with the likes of Appalachian State, Arkansas State, UL-Lafayette, Texas State, South Alabama, Troy, and Georgia Southern. Georgia State will need an upset or two in order to break their three year double digit loss column streak. The Sun Belt Conference is shaping up to be a wide-open race in 2015. Arkansas State, Texas State, Georgia Southern, Appalachian State, Louisiana-Monroe, and Louisiana-Lafayette could come out and win the conference. New Mexico State and South Alabama will look to finish in the middle of the pack while Troy, Idaho, and Georgia State will battle it out for the bottom spot. Below is the predicted order of finish. Be sure to check out the FBS Independents preview as well as the next preview on Friday. We will be looking at the Big 12 Conference then. Louisiana-Lafayette’s Alonzo Harris and Elijah McGuire ran for 372 yards combined to lead the Ragin’ Cajuns past Arkansas State on Tuesday night. McGuire was especially impressive with 265 yards and 4 touchdowns rushing on 19 carries in the 55-40 win. 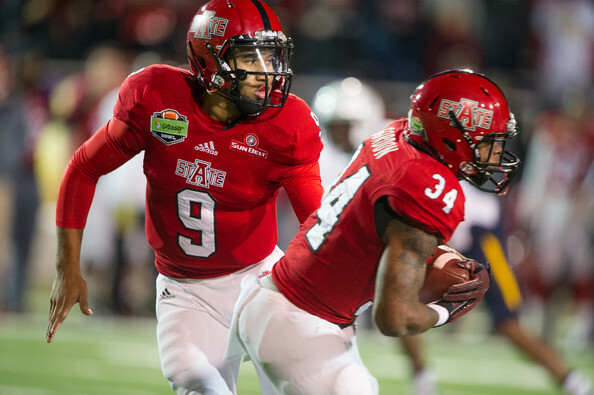 The fireworks started early with Arkansas State’s Fredi Knighten outrunning the defense to the end zone on a quarterback keeper to make it 6-0. The extra point would be no good, as it hit off the goal post. The Ragin’ Cajuns came down the field with a touchdown of their own courtesy of Alonzo Harris from 4 yards out to make it 6-6. Hunter Stover had his extra point blocked in an odd beginning for both kickers. Arkansas State ended up getting a field goal on the next possession to take a 9-6 lead, but they would soon find themselves trailing after another touchdown run from Harris (22 yards) to make it 13-9 in favor of Louisiana-Lafayette. The Red Wolves had a fantastic chance to at least get a field goal, but J.D. McKissic’s pass for Tres Houston on the trick play was a bit too long. Several plays later, Knighten threw an interception on a screen pass that was brought back to the one yard line. Harris pounded the ball on the next play and it became a 20-9 lead. The Ragin’ Cajuns extended the lead even further after forcing a punt. On the fourth play of the drive, McGuire burst through the opening in the line and no one was going to catch as he ran for a 74 yard touchdown. McGuire would add his second touchdown on the following drive with a punishing 13 yard run and UL-Lafayette had a commanding 34-9 lead with less than 9 minutes left in the first half. The Red Wolves began the comeback with Michael Gordon’s 70 yard touchdown run to make it 34-16. The play was very odd looking as Gordon landed on top of his own lineman and then ran into the end zone. The officials ruled he never was not down and replay confirmed the call. After forcing a punt, Arkansas State cut the lead to 34-23 when Knighten found Dijon Paschal behind the defense for an 87 yard touchdown pass. Despite all the fireworks, there would not be any scoring in the final 4:29 of the second quarter. The third quarter, and most of the second half, would lack the same amount of offensive firepower that was showcased in the first twenty-five minutes of the game. The only touchdown of the third quarter came as a result of an odd playcall by Blake Anderson of Arkansas State. On fourth and 11 from his own 8 yard line, he called a fake punt that resulted in a two yard loss. Two plays later, Harris ran in for his fourth touchdown from four yards out and the Ragin’ Cajuns extended their lead to 41-23. After a 17 play drive, the Red Wolves hit a field goal with 10:10 remaining to make it a 41-26 game, but there was still plenty of work left to do. They would, however, force a punt and get the ball back with 7:56 left on the clock. The Red Wolves would get another touchdown with Knighten hitting Pachal for a 6 yard touchdown. However, with the score at 41-32, Anderson decided to go for two and it would go horribly wrong. That left the Red Wolves down by 9 points with 5:37 left. In the end, the two point try would be a moot point. McGuire once again burned the Red Wolves’ defense with a 43 yard streak to the end zone and a 48-32 lead. The Red Wolves would answer with a touchdown. On fourth and goal from the 12, Knighten hit Houston for the score on the edge of the end zone. They would convert the two point conversion to make it 48-40 in favor of UL-Lafayette, but the running game would put this game beyond doubt. On third and 10 from the UL-Lafayette 46 yard line, McGuire went off the right side and once again ran away from the defense, just as he had done so many times previously in this game. That would cap the scoring at 55-40 and a big win for Louisiana-Lafayette. Fredi Knighten went 26 of 37 for 344 yards with 3 touchdown passes and an interception. He also carried the ball 15 times for 72 yards and a touchdown. Michael Gordon had 134 yards and a touchdown on 15 carries. J.D. McKissic had one carry for 55 yards, but he was electric throughout the night. McKissic also caught 7 passes for 99 yards. The leading receiver was Dijon Paschal with 8 catches for 141 yards and 2 touchdowns. Tres Houston also caught 5 passes for 58 yards and a touchdown. Terrance Broadway had a quiet night at quarterback, but with the running game he was provided it was expected. Broadway went 9 of 17 for 102 yards with no touchdowns and no turnovers. He also ran 8 times for 38 yards. His top receiver was James Butler with one catch for 34 yards. C.J. Bates caught two passes for 28 yards. The true story of this game was the Louisiana-Lafayette running game. Elijah McGuire ran for 265 yards and 4 rushing touchdowns on 19 carries. He had an average of 13.9 yards per carry. Alonzo Harris ran 27 times for 107 yards and 4 touchdowns. The entire team ran for 419 yards and 8 touchdowns on 56 carries for an average of 7.5 yards per carry. Arkansas State (4-3, 2-1) has extra time off to prepare for their next opponent in Idaho. They will travel to face them on November 1. Louisiana-Lafayette (4-3, 3-0) is now on a three game winning streak. They have their homecoming game on November 1 against South Alabama. This article originally appeared on VAVEL USA. Terrance Broadway had 326 yards of total offense to lead Louisiana-Lafayette to a 34-10 demolition of Texas State on Tuesday night. ULL outgained Texas State 516 yards to 270. The game began perfectly for ULL as Broadway hit his running back Elijah McGuire on a wheel route on just the second play of the game. That went for 62 yards and a touchdown to make it 7-0 after 44 seconds elapsed. On ULL’s third drive, Hunter Stover missed a 46 yard field goal to the left to keep it at 7-0. Texas State had a tough time getting their offense in gear during the first quarter, but was given a gift when Daniel Cadona’s punt traveled only 16 yards and went out of bounds at the ULL 26 yard line. The Bobcats had to settle for a 20 yard field goal from Will Johnson. ULL extended their lead on a bizarre looking play. Tyler Jones was sacked and fumbled on the play by Trae Johnson before Christian Ringo came away with the ball and ran it back for a touchdown. The bizarre part was that Johnson was celebrating the sack while the ball was still loose on the ground. Nevertheless, ULL led 14-3 and continued their dominating defensive play for the remainder of the game. ULL made it 21-3 with Alonzo Harris pounding the ball in from a yard out after McGuire ran for 36 yards on the previous play. That would be the score at halftime as Texas State sputtered on offense. The second half featured more of the same with Texas State struggling on offense and ULL dominating on defense and moving with ease on offense. ULL’s first drive resulted in another touchdown with McGuire running in for a 13 yard score to extend the lead to 28-3. ULL had a chance to make it 35-3, but Broadway was picked off David Mims at the three yard line to end that specific scoring threat. The fourth quarter saw 19 and 32 yard field goals from Hunter Stover to make the lead as high as 34-3. Brice Gunter’s 33 yard pass from Tyler Jones was a minor consolation for the Bobcats who had little success in the game. Terrance Broadway went 14 of 21 for 225 yards with a touchdown and an interception. He also ran for 101 yards on 19 carries. Alonzo Harris had 79 yards and a touchdown on 18 carries while Elijah McGuire had 8 carries for 64 yards and a touchdown as well. McGuire led ULL in receiving with 4 catches for 85 yards and 1 touchdown. Al Riles caught 3 passes for 81 yards for ULL as the second leading receiver. Tyler Jones went 14 of 23 for 176 yards with a touchdown and an interception for the Bobcats. Robert Lowe managed only 36 yards on 8 carries while Terrence Franks had 30 yards on 7 carries. The Bobcats had 35 carries for 94 yards as a team (2.7 average). The leading receiver Brice Gunter with 2 catches for 50 yards and the lone Texas State touchdown. Ben Ijah had 3 catches for 34 yards while Lawrence White caught 2 passes for 31 yards. Louisiana-Lafayette (3-3, 2-0) have another Tuesday game next week against Arkansas State (4-2, 2-0). Texas State (3-3, 1-1) have 10 days off before traveling to face UL-Monroe on October 25.